Get Stellar Participation When You Ask Your Kids Class Questions! Have you ever attended a seminar, workshop or class where the presenter/teacher asks a question, and nobody wants to answer? Maybe they don’t know the answer, or they’re afraid of being wrong. It can be frustrating to the teacher, students and spectators when cricket chirps follow a question. This silence not only disrupts the flow of what is being taught, but it makes things a little uncomfortable. This may have happened in your own martial arts classes, especially if you teach kids. Instead, wouldn’t you like to encourage and improve verbal participation in class? Are you ready to see all your students raising their hands with enthusiasm when you ask a question? STEP 1. Know what you are going to ask before you ask it. Don’t just come up with a random question on the fly, or ask only for the sake of asking a question. Make it part of your lesson that day. Plan ahead and prepare. If you follow the next steps laid out here and ask this question at the proper time (at the end) you will have great success and a new formula for engaging students in class. STEP 2. Prime the pump. Tell your audience how to practice a round kick to the head. Yes, you will give them the answer. Be sure that you have constructed your ideas ahead of time. Let’s say that you have decided that stretching, balance and good form are the three essential elements for a successful roundhouse kick to the head (you don’t have to agree with these elements, but for the purposes of this class-engagement example, we’ll use these). Warm up the class with some kicks and then have your students stretch. While they are stretching, tell them that being flexible is one of the keys to being able to kick higher. You can reinforce this by having them kick after stretching and ask one or two students, “Isn’t your kick higher now that you have stretched?” Then tell the class, again, that stretching is key to being able to kick higher. Don’t worry about repeating yourself too many times. Just like you have to practice a move multiple times to get it correct, your students may need to hear information several times before they truly commit it to memory. Next, focus on the second element: balance. Instruct students to practice chambering, but not kicking. Let them know that proper balance helps to achieve great chambers, which in turn lead to great kicks. Have your students pair up and see who can chamber the fastest, then the highest. While they are practicing with each other, compliment their balance. The person who keeps their chamber leg up the longest wins. Then have a contest between the winners in each group. Make a point of acknowledging that the winner used really great balance, and that that is one of the elements of a great kick. Tell little Susie that she has great kicking potential because of her ability to balance so well. Lastly, work on good form, the third essential element of a great kick. Get out your Century Body Shields and have students partner up with a different person this time. Have them take turns doing their kicks in slow motion. Tell your students that anyone can kick fast, but you are going to teach them how to kick better! Kicking slowly allows your students to have great form because they can get immediate feedback from their partner and the instructor. Ask one of the students to volunteer to hold the Century Body Shield while you demonstrate a nice, slow, intentional roundhouse kick to the body. Explain to them that you already stretched and practiced good balance, so now it’s time to work on good form. You have just told everyone in class the three elements of a great kick. They all know the answer to the question that you are going to ask. At this point you are bursting at the seams; you are so excited that everyone will know the answer to your question today! Give them some time to give each other feedback while practicing slow kicks to the body. Move from group to group and give constructive advice about progress. Get out your Century Square Hand Targets and distribute one to each student. Have the students take turns kicking the hand targets starting with kicks to the body and gradually raising the target to head level. Let them practice for a few minutes and then tell them that their kicks are improving. Put the pads away and have everyone spread out, then call out 10 kicks on each leg. Tell your students that their hard work is paying off. STEP 3. Ask the question. “Who can tell me one of the three most important elements are to practicing a roundhouse kick to the head?” you ask, and watch the hands go up! You will see that even the most timid student knows at least one of the three elements you are looking for – how exciting! Students know the answers. Parents are excited that their kids are participating. You have taught an amazing class. Everybody wins here! RECAP: If you want great class participation, you have to give out the information that you expect to get back. Students might already know the answers, but it is your job to make sure that they know that they know, by teaching and showing instead of just telling and counting on memory. Give them the physical workout associated with each verbal answer and you will be sure to grab the attention of auditory, visual and kinesthetic learners. Go teach a great class and watch your students succeed! 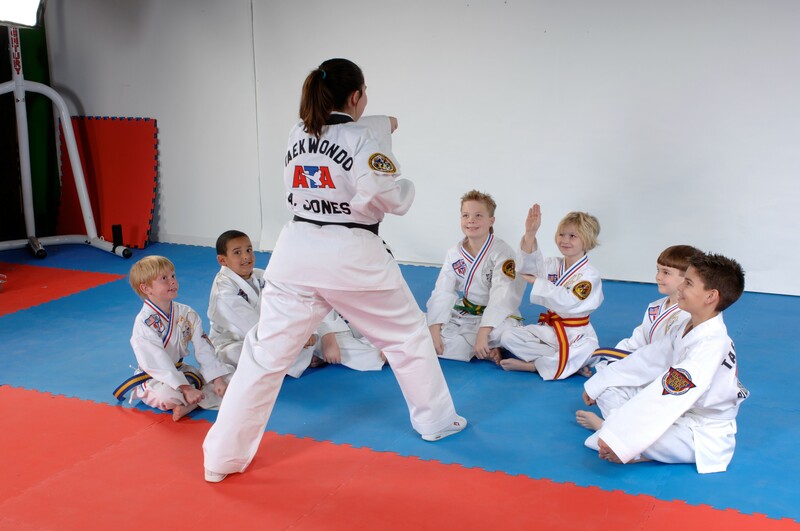 Sensei Deb Cupples is the founder of Community Karate and Fitness in Colorado Springs, CO. She has been studying karate since 2003 and is a fourth-degree black belt.